Winner of Name that Ware November 2006! Wow, I think it’s impossible to stump people. And, to boot, I have a very hard decision this time around, because some of the participants dug very deep into the technical aspects, and others got the packaging question almost exactly right. This time, the prize goes to “echo” because he had both the most in-depth technical analysis while simultaneously getting the packaging questions almost exactly right. Congratulations! email me to claim your prize. Eliot, just after “echo”, deserves the honorable mention for nailing the packaging question and then one-upping me with the link to the “Treo”-boxed nano. 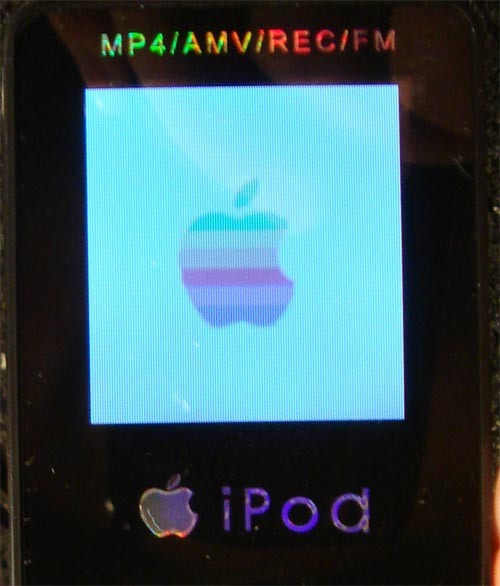 It is a direct iPod Nano knock-off! In fact, as far as I can tell, the box is authentic. I got this device in an electronics market in Shenzhen, where dozens of vendors were selling all kinds of knock-off devices like this. I don’t think those typos are just because the person who copied this doesn’t know how to type. I was talking to a friend in Hong Kong, and he said that knock-offs like this are regulated by what’s called a “16-point program”. 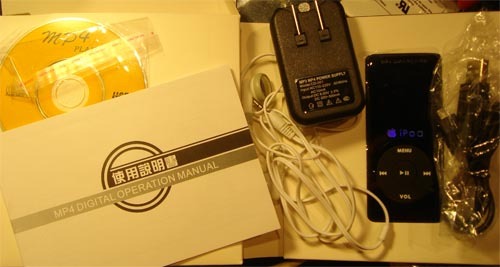 The manufacturer must demonstrate 16 differences between his product and the original: this can include things like changing “Apple” to “Appls”, or in another case, “Motorola” to “Mokorola”. Each misspelling counts as one difference. So as long as the manufacturer can point to a total of 16 differences, it is okay to sell. It’s remarkable that the copied device does more than the original Nano does with just one logic chip and one memory chip (there are no large chips on the reverse side of the board). 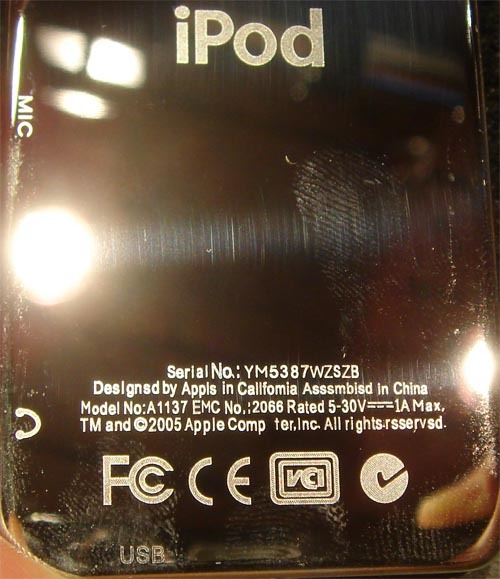 The copied device can play music, of course, but it also has a microphone, as evidenced in the photo below, so it can record your voice. It comes loaded with a demo video clip which plays quite nicely, although I never uploaded a video to it to see how well it works on my own coded video. The most impressive part about this is what I bought it for: $22. That’s it! Of course, I had to haggle the price down, but the initial asking of the vendors was only about $50–what’s even funnier is that my boss was there watching me haggle, and he was so heartbroken that I didn’t get them down to $20 when I decided to buy two of them (usually they give you a “volume” discount, but I may have been coming close to their cost). 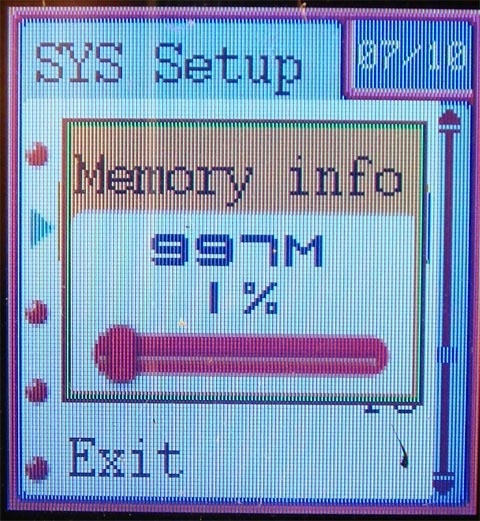 Even though the device has only 128 MB of memory, the vendor, the box, as well as the memory reporting screen, proclaim the device as having “1 GB”–leveraging the ambiguity between 1 Gigabit and 1 Gigabyte (or as it says below, 997″M”–997 Megabits). Still, $22 is not a bad deal for even what was in this package. If you asked me to guess its cost, I would have arrived at a number higher than $22, for sure. 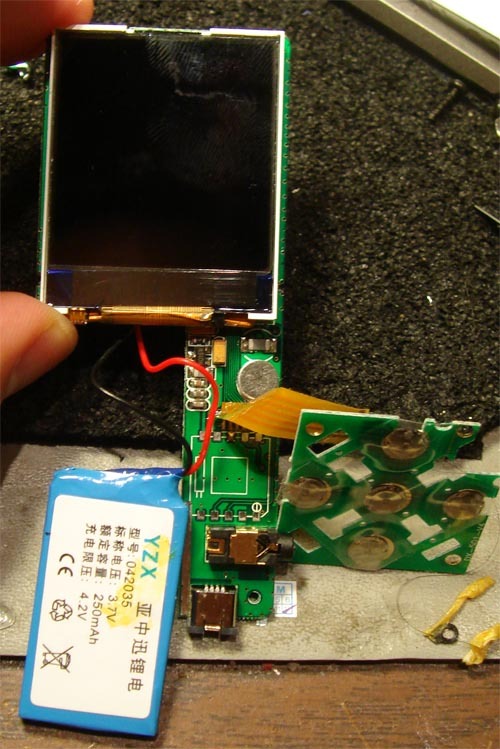 However, now that I’ve looked at the inside and thought about it a bit, the low-grade LCD can be bought for about $2-3, and the battery pack (which one website claims to last about 7 hours) is maybe only $2-3, max. 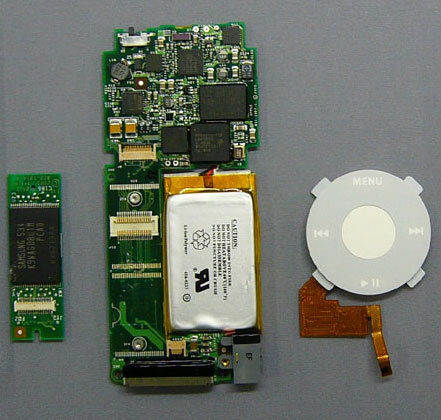 With just 128 MB of Flash and one other chip, I could see how perhaps it was built altogether for a cost of around $20–truly impressive, however, and a demonstration of the insane capabilities of the product copiers in China. Here are a couple of websites that present the same device, but in a more legitimate dress: a japanese site, and what seems to be the way to reach the vendor and order more. At 100 minimum order quantity, that’s only $2k for 100–and I bet you could sell these on the streets for $60 easy–at least until the copyright cops come and bust you. 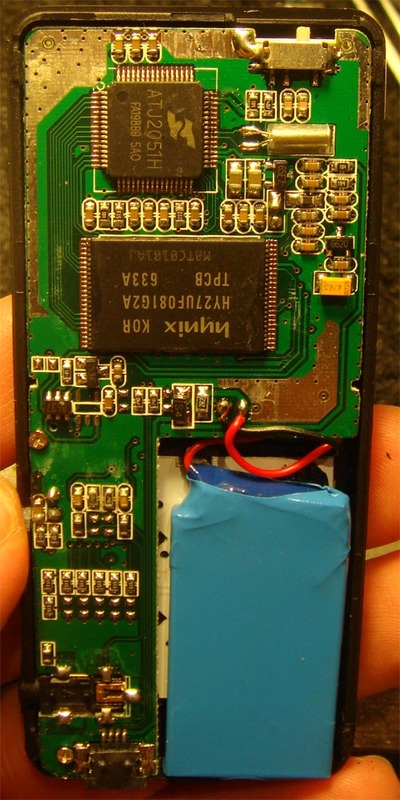 As some of the Name that Ware participants noted, you can find the schematics for a similar device (the HR-631 MP3 player) on-line. I’m not sure if someone reversed it or if they just leaked it, but I found my copy at this chinese BBS (click the link at your own risk–I wouldn’t be surprised if the BBS contains lots of links and exploits that will pwn an unpatched browser), which also seems to contain numerous other schematics and firmware information for people interested in making their own copies of devices. This entry was posted on Saturday, December 16th, 2006 at 9:11 pm and is filed under Hacking. You can follow any responses to this entry through the RSS 2.0 feed. Both comments and pings are currently closed. Heh, nice writeup. I think you’re wrong about “getting them close to their cost”. From past experience, you probably paid 2X their cost. Vendors are smart enough to make you feel like you’re ripping them off even though you think you hit bottom. Protel, now Altium Designer seems to be hackers’ choice. I knew hacking was lucrative somehow…these guys just figured it out before us. Someone just brought me the exact unit $20 CDN, appears to work fine initialy. Will receive numerous files, but will only play first 21 song of a 28 song file. Who knows. Perhaps it’s a firmware issue. Thank for your note. This is a wonderful tool. 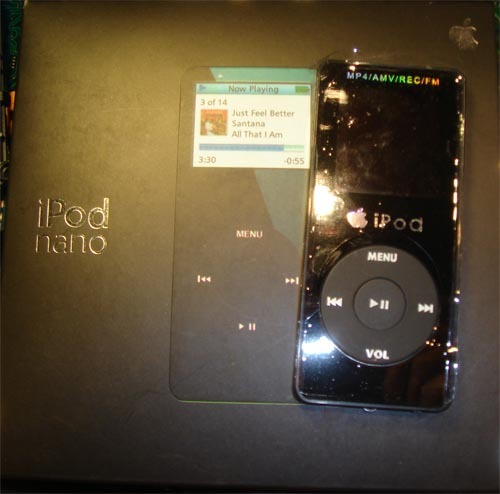 It is more then apple’s iPOD nano. I would like to get the updated drivers for this device for 2GB, if it available for download.